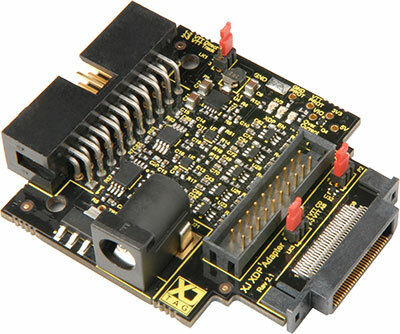 The XJXDP adapter complements the XJLink2 by providing a very low impedance drive capability, down to 25 Ohms or less. The small form factor board can be directly mounted onto an Intel® eXtended Debug Port (XDP) for minimum wire lengths and maximum performance, or connected via a 2 mm 20-way ribbon cable. Some devices, notably Intel processors, use low voltage signaling with low value termination resistors typically in the range 0.8 V to 1.2 V and 25-50 Ohms. The XJXDP uses purpose designed low impedance drive circuits to get the highest noise margins and fastest JTAG clocking speeds. Precision, ultra-high speed comparators, with resistor-programmable hysteresis are used as uplink receivers for the highest receiver noise margin and speed performance. In addition to the XDP port connector, a standard 2mm pitch header is provided to allow ribbon cable connection for non-XDP applications. The XDP connector can also mate with a flex XDP-to-XDP extender cable. The XJXDP uses a high efficiency tracking power supply to track the DUT’s VTT output (voltage reference), enabling it to drive low impedance downlink signals with minimal loading of the DUT. The XJXDP can be powered directly from the XJLink2 or from an external power supply. Low impedance downlink drivers can produce extremely fast edges that can cause undesirable overshoot, leading to loss of signal integrity and reliability. The XJXDP signal drivers moderate rise/fall times to enable the highest clock speeds, with the greatest reliability and highest test throughput. The XJXDP connects to the XJLink2 (or XJLink) via a standard 20-way ribbon cable and level-translates 8 signals, divided between 3 uplink and 5 downlink. Order code: XJTAG-XDP-0010. Please contact your local distributor for a quote.